Encourage your students to perform acts of kindness. Spring fever is in the air and students are not always nice to each other this time of year. You can change that with this original poem and accompanying activities. 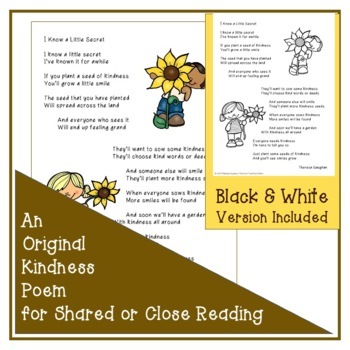 The original poem will work well to supplement any reading or social skills curriculum. Use the poem to teach reading skills such as structure (rhyme and rhythm), inference, and metaphor. Have students respond to the writing prompt in order to make personal connections to the poem. 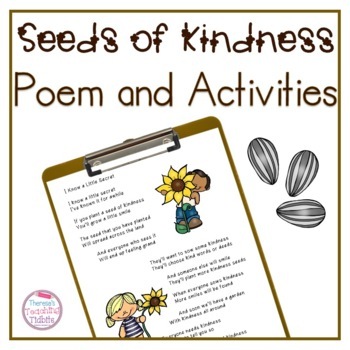 Use the poem to start a class discussion about kindness. Create an anchor chart that identifies acts of kindness (seeds). 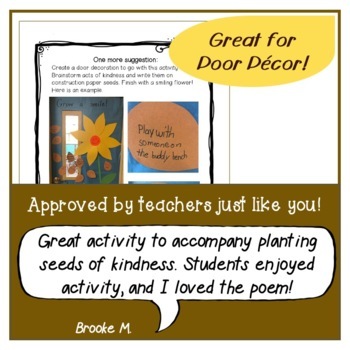 Then, create an awesome door decoration that reminds students throughout the school to be kind. Challenge your students to perform 100 acts of kindness. Keep track using the included kindness cards. Reward acts of kindness with colorful brag tags. Check out some of my otherkindness resources! Like poetry? You may enjoy using my Poem of the Week Resources. Thank you for your interest in my resources. Make sure you follow my store if you'd like to know when I post new products or when my store is on sale!